EL CENTRO Victor Ramirez is the new manager of the Chicano Indian American Cultural Center. He took over the position on March 1st after we lost Hector Perez to Texas several weeks prior. He has been providing effective leadership that is so much needed to promote our cultural heritage and attain more educational opportunities for Chicanos, Latinos, and Native Americans at the University of Iowa. 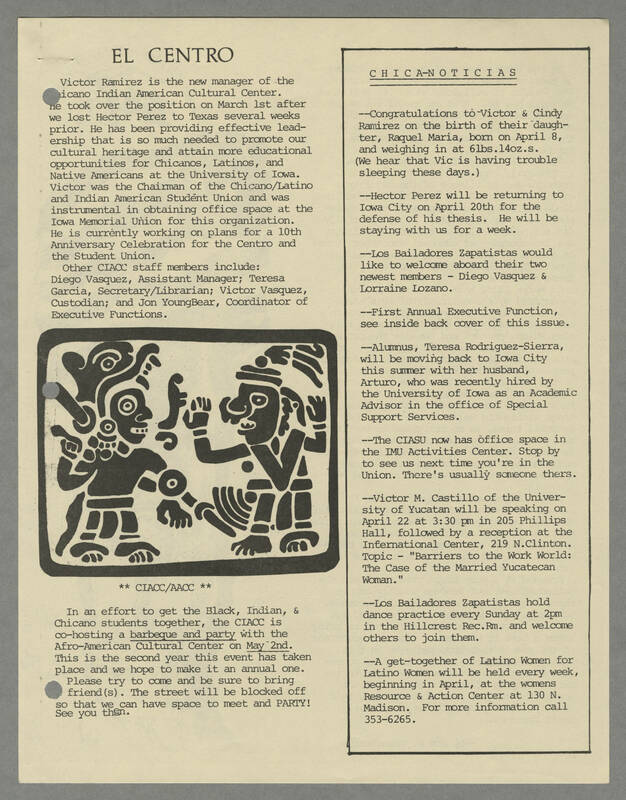 Victor was the Chairman of the Chicano/Latino and Indian American Student Union and was instrumental in obtaining office space at the Iowa Memorial Union for this organization. He is currently working on plans for a 10th Anniversary Celebration for the Centro and the Student Union. Other CIACC staff members include: Diego Vasquez, Assistant Manager; Teresa Garcia, Secretary/Librarian; Victor Vasquez, Custodian; and Jon YoungBear, Coordinator of Executive Functions. ** CIACC/AACC ** In an effort to get the Black, Indian, & Chicano students together, the CIACC is co-hosting a [[underline]]barbeque and party[[end underline]] with the Afro-American Cultural Center on [[underline]]May 2nd[[end underline]]. This is the second year this event has taken place and we hope to make it an annual one. Please try to come and be sure to bring friend(s). The street will be blocked off so that we can have space to meet and PARTY! See you then. [[underline]]CHICA-NOTICIAS[[end underline]] --Congratulations to Victor & Cindy Ramirez on the birth of their daughter, Raquel Maria, born on April 8, and weighing in at 6lbs.140z.s. (We hear that Vic is having trouble sleeping these days.) --Hector Perez will be returning to Iowa City on April 20th for the defense of his thesis. He will be staying with us for a week. --Los Bailadores Zapatistas would like to welcome aboard their two newest members - Diego Vasquez & Lorraine Lozano. --First Annual Executive Function, see inside back cover of this issue. --Alumnus, Teresa Rodriguez-Sierra, will be moving back to Iowa City this summer with her husband, Arturo, who was recently hired by the University of Iowa as an Academic Advisor in the office of Special Support Services. --The CIASU now has office space in the IMU Activities Center. Stop by to see us next time you're in the Union. There's usually someone thers. --Victor M. Castillo of the University of Yucatan will be speaking on April 22 at 3:30 pm in 205 Phillips Hall, followed by a reception at the International Center, 219 N.Clinton. Topic - "Barriers to the Work World: The Case of the married Yucatecan Woman." --Los Bailadores Zapatistas hold dance practice every Sunday at 2pm in the Hillcrest Rec.Rm. and welcome others to join them. --A get-together of Latino Women for Latino Women will be held every week, beginning in April, at the womens Resource & Action Center at 130 N. Madison. For more information call 353-6265.